Five-time Open champion Tom Watson rolled back the years with an opening round of 65 to lie one shot off the lead in the 138th Open Championship. The 59-year-old American shot five birdies in a bogey-free round to leave him tied with 2003 champion Ben Curtis, one shot behind Miguel Angel Jimenez. In fine conditions, Watson posted his best Open score since a second-round 65 in 1994, also at Turnberry. "The golf course played with no wind and was an easy test," said Watson. Watson famously won the Open in 1977 at Turnberry, when he overcame Jack Nicklaus in the epic "Duel in the Sun". "It was not much of a surprise for me to go out there and get under par," he added. "Playing the practice rounds I felt very good about the way I was hitting the ball and the way I was putting. "She (Turnberry) was defenceless today. If you can have an easy test in the Open Championship, that was it." Watson has five Open titles to his name, winning in 1975, 1977, 1980, 1982 and 1983. His other Major victories came in the Masters in 1977 and 1981 and the 1982 US Open. Watson is not the only former Open champion who performed well in this year's opening round in Scotland. 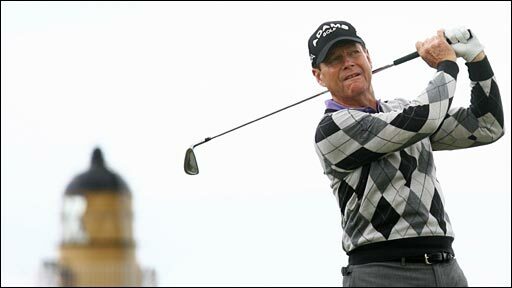 American Mark Calcavecchia, the 1989 winner at Troon, and compatriot Mark O'Meara, who triumphed at Royal Birkdale in 1998, both carded three-under rounds of 67. However, the 1986 and 1993 champion Greg Norman, who last year held the 54-hole lead in the Open at Birkdale only to fade on the final day, carded a disappointing seven-over 77 for this year's opening round. All the talk though was of Watson and the memories of 1977 evoked by his superb round. "I feel inspired playing here," he said. "I feel like I'm playing well enough to win the golf tournament. "It doesn't feel a whole lot out of the ordinary from 32 years ago except that I don't have the confidence in my putting as I had 32 years ago." Watson, the oldest player in the tournament, was partnered in the first round with 29-year-old Sergio Garcia and 16-year-old Italian amateur Matteo Manassero, the youngest player in the field. Watson outplayed both, with Garcia carding a 70 and Manassero 71. "The older guys have an advantage," said Watson. "We've played under these conditions and we kind of get a feel for it. "There are certain shots out here that the kids are unfamiliar with and I still feel I can compete against them." Watson snatched an early clubhouse lead on the final hole from Australian John Senden, who only gained entry to the tournament on Tuesday when Jeev Milkha Singh withdrew with an injury, but had earlier birdied four of the last six holes for a 66. Watson was later joined by fellow American Curtis, who despite two bogeys, was able to card 65 thanks to five birdies - four coming in the last six holes - and an eagle on the seventh. Senden was later joined on four-under by fellow Australian Mathew Goggin, Americans Steve Stricker and Stewart Cink and Columbian Camilo Villegas.